There aren’t many things scarier than getting ready to go into battle and fight a war. That’s how Joshua felt just before going into conquer the land God had promised the people of Israel. So God spoke to Joshua the above words to encourage and reassure him of God’s presence with the people. It’s seems everyone lives in fear today. In fact, you could probably list a dozen things you are afraid of right now. But just like it was with Joshua, God doesn’t want you to live in fear of what’s around you. He wants you to be strong and courageous. He wants to send you out with boldness and bravery to fulfill your God-given destiny. Fear is one of those emotions that holds us back. When we are fearful we make poor decisions. Sometimes fear causes us to make no decision at all, because we are uncertain of the outcome. Dwelling on this verse can help you overcome those issues at times when you are afraid. We forget all that God has done for us in the past and is doing for us in the present because we are easily distracted. We get so caught up in the stresses and problems of the moment that we don’t remember we serve a God who has always been there for us. When we forget how He has blessed us, we’ll begin to question whether our relationship with Him is worth it. This list proves it…don’t ever let anyone tell you following God is for fools or a waste of time. He has done a lot for us. Never forget it. Anytime you get dirty playing outside you go take a shower. The soap and water help get rid of all the dirt on your body. It’s a cleansing process you go through to look and smell better than before. Young men and women should strive to have a life that is clean. Purity should characterize your life. That word purity is one our society doesn’t talk much about. In fact, most consider it weird to talk about maintaining a pure life. Instead, our culture encourages us to do what feels good in the moment regardless of the moral implications. God knows though that guarding your mind, body and heart is important. It’s important for all of us but especially teens. Mistakes you make now can haunt you the rest of your life. So how can you cleanse your way if there is junk in your life? How can you keep your way pure? The answer is in the verse. “By taking heed…” – listening to, embracing, and following the words of God. 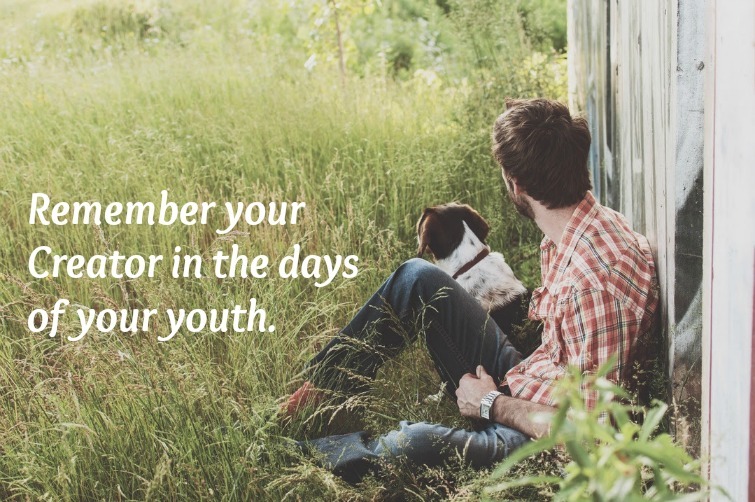 Believe it or not, life is more carefree and much less complicated when you are young. It may seem like you are bogged down with all the things you need to do. However, teens have much less responsibility than adults. Most teens have not started their career, started their marriage or started their family. They don’t have a lot of financial responsibility and fewer medical issues to worry about. It’s nice to be a teen. So NOW is the time to set your priorities straight. If you don’t, it will be so much more difficult later when life gets more complicated. This Bible verse challenges us to direct our focus, hope and security to God so that it becomes ingrained…so that it becomes second nature. Doing this now prevents you from feeling the back end of this verse later in life. While all those future complications of life will come, you can still find pleasure in them. But not if you take your eyes off your Creator. One of my favorite Bible verses for teens is Jeremiah 29:11. It speaks directly to THE question every teen has – “What does God have planned for me?” It’s frustrating not knowing what God has in store for your life. That’s why these words are so encouraging. God is offering words of promise and hope for your future. He has a plan for you and He knows what it is. He will reveal it to you. God won’t keep it a secret. And notice what the thoughts are. They are thoughts that 1) you will have a future and 2) that it will be a blessed one. So be patient and wait on God’s plan to unfold. He will bring it about in His timing. Since Jeremiah 29:11 is true, then you should be willing to buy into the concept of this next Bible verse. Is putting your trust in something easy? Not always. But we put our trust in more things than we realize each and every day without even thinking about it. We trust the lights will turn on when we flip the switch, the chair at the kitchen table to hold us while we eat breakfast and for the Wi-fi to be working when we need it (even though sometimes those things do fail us). So why is it so hard to put our trust in God who never fails us? It’s funny when you think about it because we’d rather trust ourselves. Yet time and time again we fail ourselves. We trust in our own understanding even though our understanding of situations is off base, incomplete and limited. When you trust in and acknowledge God, He will direct your path. He will direct you towards His plans for your life that He promised would be coming in Jeremiah 29:11. You may be struggling right now with understanding why God has allowed something to happen in your life. Maybe you’ve had a death in the family. Or perhaps your parents got a divorce and it’s caused a lot of conflict in your personal life. You might think that you are not as smart, athletic or good looking as you want to be. Maybe your friends have turned on you or your health is bad. It may just feel like your life is not turning out the way you want and it doesn’t feel very good. I don’t know why God allows certain things to happen. But I do know the truth of this verse – that all things have a purpose and God is working towards some good in your life. It’s hard to see that sometimes through the pain and tragedies that happen. But it’s up to us to learn the lessons and see the good as best we can. In the old days, if you wanted to see a movie, you had to view it through a reel-to-reel projector. The projector’s light shone through it and revealed images that were stamped on the tape as it moved by. You could rewind the reels and play the movie over and over again. Your mind works a lot like a movie reel. Your brain takes in images and words and stores them for future use. We recall these images and words whenever we need or want them. Unfortunately, some reels that we play over and over can negatively impact our thoughts about our self. Romans 12:2 tells us to be “…transformed by the renewing of our mind.” To renew means to reestablish, restore or begin again. It’s about giving fresh life to something. That can’t renew yourself if your mind is taking in junk everyday. So Philippians 4:8 is all about thinking about the right things. Your mind conforms to whatever you think about. If all you are dwelling on is junk, your mind won’t have room for godly things. The final of these Bible verses for teens speaks directly to young people. When I was young, I thought that I was just a bite-sized Christian. I convinced myself that since I was not fully developed spiritually, I couldn’t be used by God. I couldn’t have been more wrong. The truth is once you have accepted Christ as Savior, you have the Holy Spirit living inside of you and can become fully committed right now. Timothy experienced this as a young man. He became a Christian and started working with some local churches. It’s implied in the text that people (older people) didn’t respect him because of his youth. His mentor, the missionary Paul, would give him some encouragement as he faced this tough situation. He challenged Timothy to be an example to others in the things he said…in how he lived and loved…in his faith and in his purity. By living this way, he would be an example of godliness and win over the hearts of those who thought he was too young. This just shows that you are never to young to serve God and be a positive example. Questions for Discussion: What other Bible verses for teens would you like to add here? Teens, how is God working in your life right now? Great post! Very encouraging and excited to study these verses more.